The garage set. You can't really go wrong with this set. 68 holds from huge jugs to tiny slopers, with enough sizes inbetween to satisfy everyone. You basically get all the best holds from all our sets, split nicely into a mix of funky bright colours. Ideal for setting routes with. Exclusive to this set are the big jugs ideal for any angle and for any level of climber. Comes with all the fixings you need and a T Bar. Delivery is via Interlink Express couriers. We guarantee your holds will be with you within one week, often within 2 - 4 days. 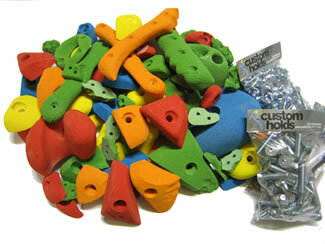 NEXT DAY DELIVERY: A large selection of our holds are now available for next day delivery. Products eligible are marked on the ordering page. For next day delivery orders must be placed by 11.00AM. All our holds come with a quality assurance guarantee. If you are not happy simply return them for a full refund.